Technology Management Survey Launches Today! Don't miss this important new TAG survey focused on technology management which looks at how foundations are managing the technology function, including what services are managed in-house versus outsourced and what applications are being hosted on-premise versus in the cloud. The survey launches today; detailed survey results will be available to participants in early July. A summary of some of the data will be available to non-participants later. TAG has launched a new TAG LinkedIn group. If you're a LinkedIn user, join today to grow your professional network and get connected to TAG's thriving community. 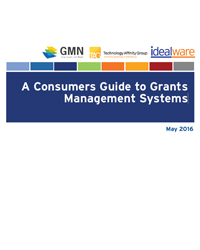 The 2016 report released by TAG and Grants Managers Network (GMN), with research conducted by Idealware, compares 29 grants management systems across 174 requirements criteria, looks at what each system does, and compares the strengths and weaknesses of each system available to grantmakers. The report was updated May 27th. Read more and download the updated version. TAG membership is by organization so there is no limit to how many staff from your organization can participate in TAG's activities and TAG access resources. Enter the email address of any staff member in the Invite New Member field and click Send Invite. Chances are, you probably think your mind works pretty well. It might lead you astray now and then, but usually it helps you make good decisions and remember things reliably. At the very least, you're probably confident that it doesn't change depending on the time of day or what you had to eat. But you'd be wrong. Our brains fool us all the time. And we typically have no idea that it's happening. For any organization budgeting for technology should be for more than just hardware replacements. A technology budget can help pave the way for the adoption of new practices and innovative strategies to meet your mission.